Cederblad 111 (Ced 111) is a blue reflection region in the southern constellation of Chamaeleon (Cha), and is part of one of the closest (~550 light years) dark cloud complexes to the Sun. It is near the top center portion of the image above. Ced 110 is the bright reflection in the lower center portion of the image with the distinct bright arc. Both are part of Cha I dark cloud complex. The median age is estimated at ~2 Myr. The cloud complex is a stellar nursery and many new stars have been detected through their variability and H-a emission. The bright, cone-shaped object near the top center is the Chamaeleon Infrared Nebula (IRN). 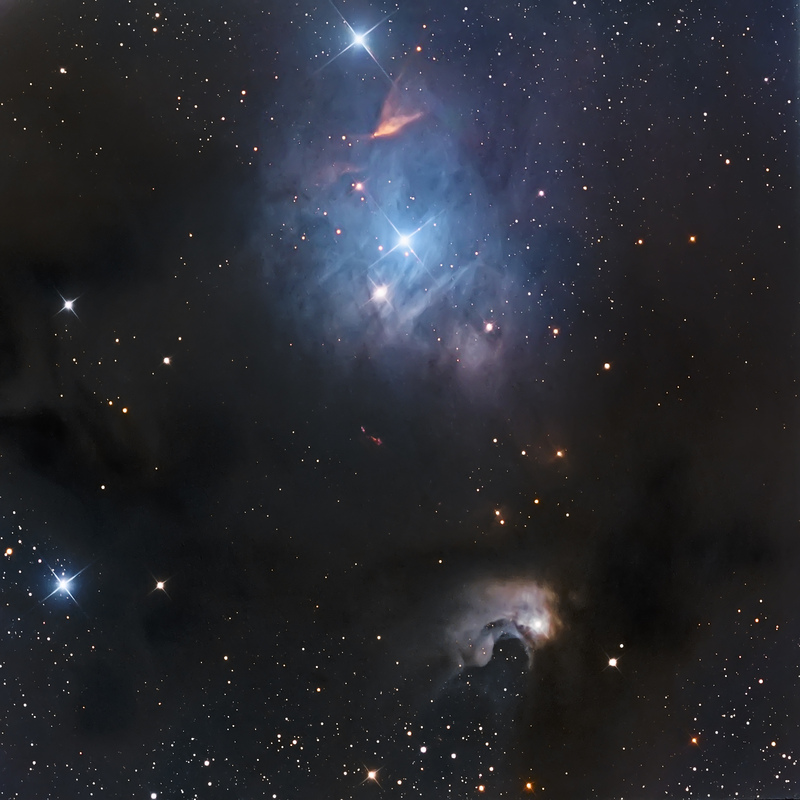 The small, elongated, bright red objects at the center of the image are Hebrig-Haro objects (HH 49-50), which form from a collision between ionized jets of gas ejected from newly born stars and the surrounding cloud. The image above is 36′ x 36′, north is down toward the right and east is up toward the right. The center of the image is RA(J2000) 11hr 06m 36s and DEC(J2000) is -77d 34m 14s. Absolutely amazing! Agree with Josep that you have a fine eye for framing. If there was an art gallery with an exhibition of cosmic scenes, this watercolour painting would be in it! This goes very well with your image of IC 2631. It would be worth doing a widefield image of Chamaeleon I complex! Wow – Really nice color balance and very smooth data!